In March, the Drive-By Truckers performance at Terminal 5 was powerful and inspired, and their two-hour and thirty minute set was met with incredible crowd energy. At that show they delivered six full encores that lasted forty minutes. The circumstances were a world apart on Thursday night at Terminal 5. With the split headliner tour and as the back half of the crowd yapped throughout the set, the band had every right to mail it in and cut it short. 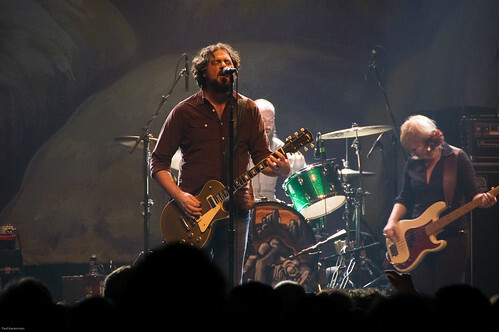 But to their eternal credit, the Drive-By Truckers delivered the same high energy for which they have become renowned. At the end of the DBT set proper, there was a bizarre crowd reaction that we have never experienced before. Instead of cheering for a band who had delivered an excellent set, the crowd used the time to increase the volume of their chatter. It got so ridiculous that the DBT roadie had to come out and exhort the crowd to cheer. Eventually the band returned and presented a bonus set of five numbers where they were joined by Craig and Franz from The Hold Steady. The set ended as it had in March, with a manic cover of Jim Carroll’s “People Who Died”. We recorded from the same location as The Hold Steady set. The quality of this recording is quite excellent, as again the DBT crew delivered well-balanced sound in venue that can be difficult to mix. Listeners will note the inescapable din of conversation at the more quiet moments, but our location, pole placement, and microphone model avoided the din during louder periods. Enjoy! This Recording is now available to Download in FLAC and MP3 at Archive.org [HERE]. 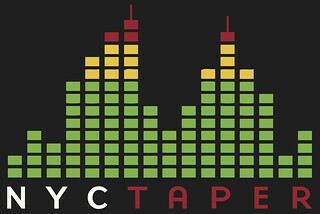 If you email nyctaper for access to this recording, we expect that you will PLEASE SUPPORT Drive-By Truckers, visit their website, and purchase the new release Brighter Than Creation’s Dark from their site, and merch from their site.